Alexa revised their ranking system again. Data is now limited to the last six months. I thought I’d look up my website. Tagged’s traffic (in blue) vs. similar popular social networks: friendster, bebo, and orkut. I got the list of competitors from TradeVibes, excepting Facebook (too large), and Piczo. As you can see, even in the last six months, we seem to be growing in the face of a declining social networking trend. That’s no surprise. we were the fastest growing social network in the United States last year in all categories (by percentage). That’s good. But let’s look at the big boys. Tagged vs. the largest social networks. Technically Tagged is larger than hi5 in the U.S. (Nielsen NetRatings: 3rd in users/day, time spent/user, and ad market share). This is worldwide marketshare. Not that I can hold a grudge, hi5 was incubated out of the same offices as Tagged—long before I joined it. Hmm, not even close (remember the graph is logarithmic). Well, at least with 19 places in the last three months, we’re still growing fast right? 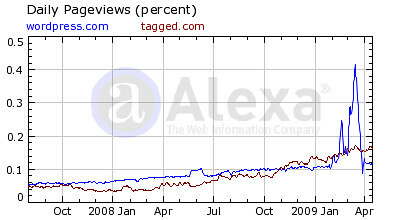 Whenever I see the Alexa traffic rank a shiver runs down my spine. Where are your screenshots from? Compete looks slightly different, or is that it? Their new data is weird, shows WordPress.com as reaching 10% of the internet a few months ago. @till I use Alexa because the data is public. In external presentations we use HitWise and Nielsen NetRatings when comparing sites. I avoid Compete because the last time I checked, their data didn’t correlate at all to results I knew to be true. That may have changed so I should probably give them a chance. If I had to guess it looks like some weird double counting on domains is going on. The number of pages/user is a flat constant for WordPress @ 1page. I would think it’d be higher if you averages across every WordPress domain. The Alexa bar in Firefox is pretty useful for calculating rivals sites traffic.